A guest post from Sherri! Wow! I am so excited to be posting for Space Girl Organics!! I was asked to do a little mini bio before I dive into the foodie fun so here it is! I am one of the few born and bred Orlando natives so I consider myself an expert on Central Florida. I went to UF and graduated with a degree in Nursing, joined the Navy, saved some lives, moved back home and now I’m blogging. Yes, I know– the ending was a little anti-climatic. My passion is health and I strongly believe that your well being is directly connected to what you put in your body. This is pretty much the entire basis for my blog. Recently, I’ve had some health problems and I realized the medical science isn’t always the answer because our health system lacks a strong basis in not only preventative medicine, but in whole body health. That’s the arena which I’ve been devoting a lot of my research and, often, it leads my right back to food. In the midst of all my doctor’s visit I found out that I am gluten intolerant. This was HORRIBLE news because I absolutely love bread, cakes and cookies. Oh, the COOKIES!!! As a result a lot of my recipes are focused on fruits, vegetables, meats and non-traditional ways of baking because let’s face it– a girl needs cake. So you can put a face to the name– this picture is of me with one of my best buds in California. 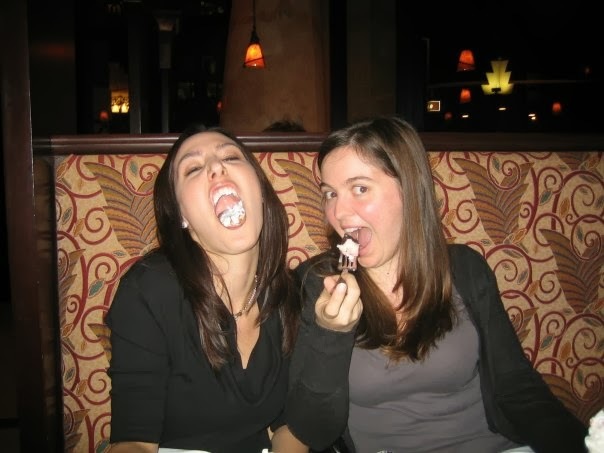 I’m the one without the food in my mouth… yet. Apparently good desserts makes us go crazy which strangely enough actually makes a lot of sense. I was so excited when I found SpaceGirl Organics because it’s so difficult to find good organic produce in Central Florida and the fact that it is delivered to my door!! Yeah… that’s awesome. I was even more excited when I found out that I could share recipes online with fellow SpaceGirl Foodies. How fun! Recently I have come into the possession of quite a few jalapeños from SpaceGirl Organics. For a while The Man and I brainstormed about what I would do with all of these jalapeños, but somehow the ideas kept coming! We started by talking about salsas, sauces, stuffed peppers, and then moved on to ideas about jalapeño breads, jalapeños for breakfast, pickled peppers, jams, and could we do a dessert?! Oh, and what about a margarita with a kick?! The ideas kept coming! We reigned ourselves in a bit and decided to stick with some tried and true recipes. We hope you like it!! 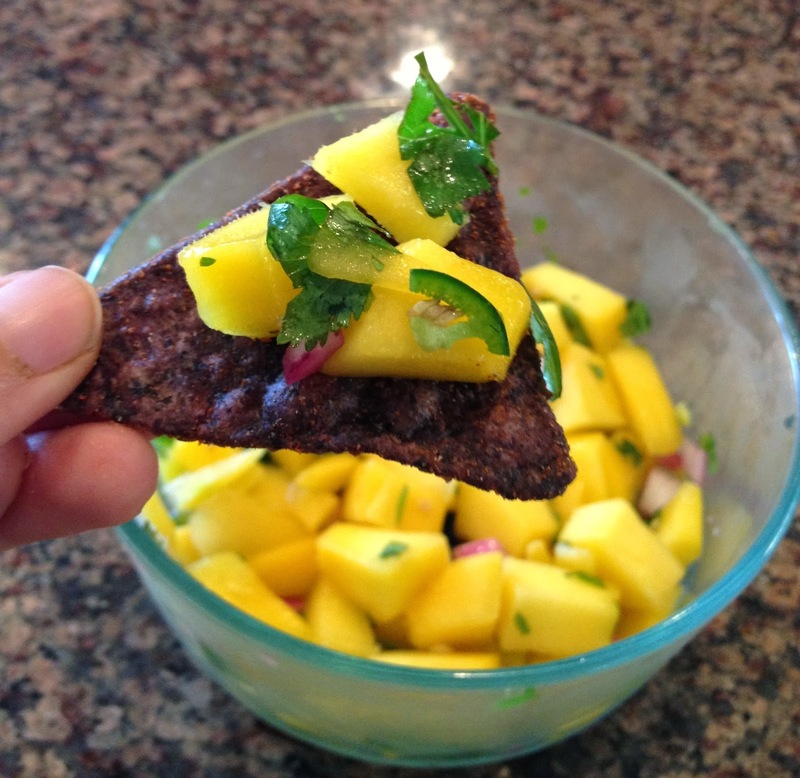 Mango salsa always makes me think of the Bahamas and eating at a little cafe by the ocean. But serious who couldn’t love it with the flavors of the sweet mango, the freshness of the cilantro and then the kick from the pepper. It almost seems like they were made for each other. This is as easy at it gets! You simply mix all the ingredients into a bowl and enjoy! Serve it on top chicken or fish or use it as a dip for chips.If you like it more spicy, include the seeds of the jalapeño and if you would like a more mild version, then simply use your knife to remove the seeds before you add the pepper to the mango salsa. Yummy!! This is one of our favorite fall meals and it’s actually pretty simple to make regardless of the plethora of ingredients. Chili is a comfort food that just makes me feel so good. This chili is packed full of shredded chicken and comes with a kick that warms you from the inside! You can adjust the heat by using 1 pepper instead of 2 and, of course, removing the seeds. In a large sauce pan, heat up the ghee (butter/oil) over med heat and add the chopped onion. Cook until the onion is soft, then add the garlic and cook until fragrant. Add the chicken and stir in the spices (chili powder, cumin, oregano). Toss to coat and then add the diced peppers (jalapeño and serrano), tomatoes, and the chicken broth. Bring to a boil, cover and then reduce the heat to a simmer. Cook for 20-25 minutes. Stir in black beans and salt and pepper. 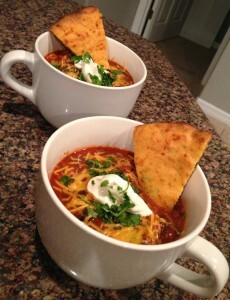 Continue to cook until the chili reaches the desired consistency, approx 15-25 minutes. Stir in cheese, if desired, and serve with toppings of your choice.